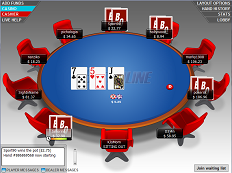 BetOnlinePoker Review - Instant Cash Bonus at BetOnline Poker for USA Players! BetOnline Poker - Accepts All USA Players! Bet Online is one of the few options left for US poker players. One of the few safe options. So if you're in the market for a US poker site I suggest that you read my review below. I cover their promotions, the games they offer and how to get started at BetOnline for real money. Bet Online provides both fake (play) and real money poker games. It's real easy to get started if you want to play poker for real money. The first thing to be aware of is that they do accept players from the USA. In fact, it's one of their biggest selling points. They also accept players from all 50 states, unlike many sites that exclude states that have strict gambling laws. Bet Online Poker is the fastest growing USA poker room. Receive a free instant cash bonus! When you sign-up to Bet Online the first promotion I recommend you look at is their Lifetime Bonus Guarantee. This is a match bonus where Bet Online will match you 15-25 percent on any deposit you make for life. (15% is matched on credit card deposits and 25% is matched on all other methods.) This bonus requires a minimum deposit of $50 and the maximum you can earn per deposit is $900. You need to roll the bonus over 6 times before you can request a withdrawal. Click here to join BetOnline Poker and receive 25% cash with your first deposit. Example - Deposit $100 and your account balance is automatically $125! $150k+ Guaranteed Tournaments - Bet Online guarantees over $150,000 in monthly tournaments. Most of these tournaments can be bought into via satellite, too. Freerolls - Bet Online runs money-added freerolls regularly. What makes theirs unique is that they allow you to play free, but you can add-on or re-buy for a price. POP (Player Options) Points - For every .10 you spend in rake you'll earn 1 point. You can use your points to enter $500 POP tournaments which are held every Friday at 5pm EST. All in all, there are a lot of ways to boost your bankroll at Bet Online. Creating your Bet Online account is straightforward. Just use the links on this page to visit the site. Once there you'll want to choose between the PC or Mac software and hit download. You'll then be taken through a wizard that will install the software to your computer, ask you to create an account and fill in your personal details (for real money games). That's all there is to it. To fund your Bet Online account you can use Visa, money orders, Moneybookers, book to book transfers and checks. Deposit limits range from $10 to $50,000, although there are a select few that have no limits. Withdrawals can be made using bank wires, person to person, Moneybookers, book to book transfers, checks and Neteller. Withdrawal limits vary from $25 to $15,000. What Games Can You Play At Bet Online? Bet Online is unique in that they only offer Texas holdem and omaha (hi/lo) games. Unless you love playing stud or mixed games, this is actually a good thing. That means the 3-5,000 players they see on a regular basis will be funneled to fewer games/tables, which means fuller and busier games overall. For their cash games, Bet Online runs holdem from .01/.02 to 500/1000 for holdem and .05/.10 to 1.50/3.00 for omaha. Variations include full ring, 6-max and heads-up. Texas holdem is the only game that runs in the tournament and sit n go section. Stakes range from 0 to $60 for tournaments and .05 to $500 for sit n go's. The variations available include heads-up, 6-max, step tournaments, satellites and multi-table. There are plenty of guaranteed tournaments too. Remember when I said that there is $150k+ guaranteed each month? That's spread out over several tournaments running daily/weekly including smaller $50, $500 and $1,000 guarantees, and much bigger ones like 7k, 10k and 20k. The $50 guarantees are a great way to build a bankroll since they have a .50 buy-in and allow re-buys. Of course, if you ever need a break from you can quickly switch to the sportsbook, casino or horse section from your Bet Online poker lobby. This gives you a ton of variety from one central location.